Your first thought on seeing it might be that perhaps this is not one of Norfolk's more exciting or interesting churches. A round tower fell in the 18th century, and the parish could afford to do no more than patch up the remains. After decades of neglect, the nave and chancel were refashioned in an uncharacteristically utilitarian manner by the Victorians, leaving a rather barn-like structure. 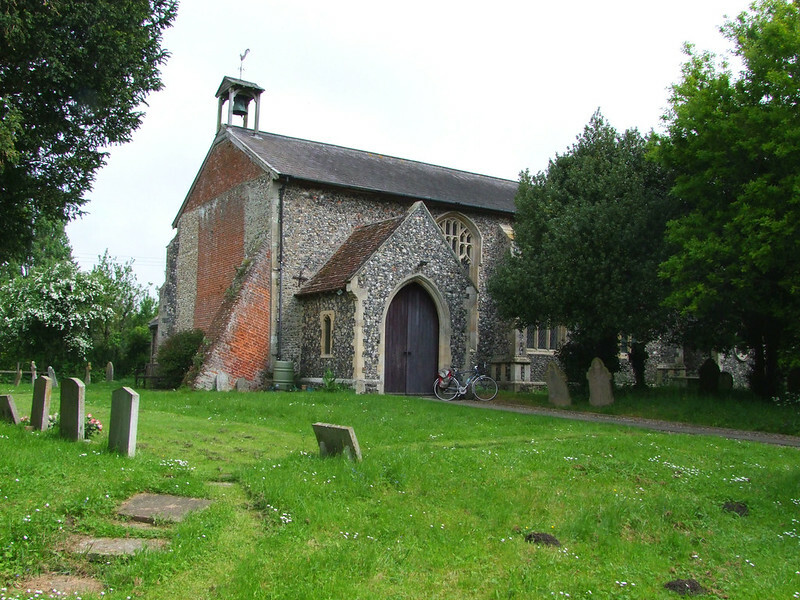 The nave walls, with their massive Perpendicular-style windows and buttressing, look very curious under the shallow tiled roof, but the scattering of red brick at the west end gives it character, and the whole piece is not unattractive in the tree-shrouded graveyard. 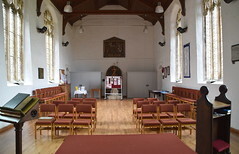 Internally, the church was converted for community use in the 1990s, giving the nave the character of a village hall. There was a further major refurbishment and repair from 2013, thanks to a grant from the Heritage Lottery Fund. However, despite the battering, repatching and refurbishing of the last couple of centuries, Burston church is full of interest. It is open every day, and you step in through the gloom of the rather austere Victorian south porch into a church full of light. 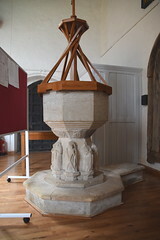 A light wooden floor replaced the Victorian tiles, and, although none of the nave furnishings were retained, the font is a decent 14th Century affair with characterful figures around the stem. 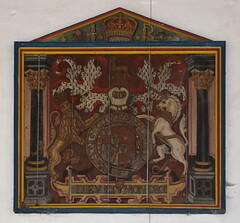 Above it on the west wall is one of Norfolk's best James I royal arms, still in its original frame. 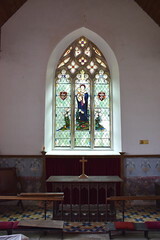 The chancel retains something of its 19th Century integrity, some of the stencilling exposed from behind the limewash which had concealed it in the 1960s when it had deteriorated to such an extent that it had become unsightly to eyes that in those days did not approve of Victorianisation of this kind. 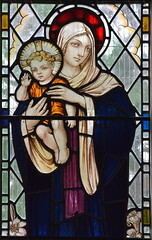 The glass in the east window is a good example of the more conservative strand in 1930s stained glass, and it would be interesting to know who the workshop was. There are memorials to two local boys killed in World War One in the nave, and one of these is of particular interest. 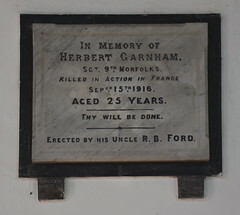 It remembers Herbert Garnham, killed on the Somme in September 1916. He was 25 years old. Intriguingly, the inscription records that the memorial was erected by his uncle. 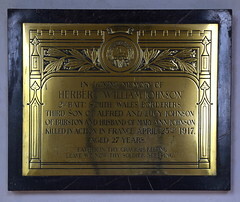 This was because Herbert's father had refused to allow a memorial to his son in the parish church. The Garnhams were participants in the Burston School Strike, a violent dispute between the rector of this church and the working people of the village. When Herbert Garnham's father learned of the memorial being placed in the church, he attacked it with a sledgehammer, smashing it to the floor. For this, he received a month in prison, and the memorial was repaired and restored to the wall, although you can still see the cracks in it today. So, what was this disagreement that tore apart this small rural community in the early decades of the 20th Century? To answer that question you should look immediately to the west of the churchyard, for here on a patch of grass sits the world famous Burston Strike School, a memory of what is sometimes referred to as the longest strike in British history. 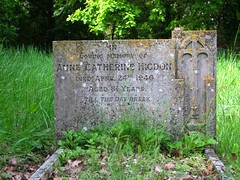 In 1913, Kitty and Tom Higdon, headmistress and senior teacher respectively of the Burston Church of England village school, came into dispute with the school managers after Tom Higdon had been elected to the parish council. The Higdons were Christian Socialists, and were widely perceived as troublemakers. They refused to let the children be taken out of school to help with the harvest, or to do back-breaking, poorly-paid work like stone-picking. Such employment was illegal, of course, but it was the universal practice in rural areas at the start of the 20th century. The Higdons' nemesis was the Reverend Charles Tucker Eland, Rector of St Mary. He was a clergyman of the old type, an unchallenged authority figure in this parish without a resident squire. Not surprisingly, he held Victorian views of the relationships between the classes, as did the majority of the tenant farmers. The 1870 Education Act had decreed universal education, but the role of education was so often interpreted as preparing the children for their place in the social order. Under such circumstances, learning to read and write was acceptable, but learning to think was positively to be discouraged. It was expected that the boys of the parish would become poorly-paid farm workers, and the girls would go into service. Tom Higdon was a popular figure with the local farmworkers, and he championed their fight for higher wages and better conditions. Universal suffrage for men allowed him to top the poll in the Parish Council elections, and the Reverend Eland came bottom, losing his seat. But, crucially, he still led and controlled the School Board. Within days, the School Board found an excuse to sack the Higdons from their roles as headmistress and senior teacher. Twenty years earlier, that would probably have been the end of the story. Twenty years later, it perhaps wouldn't have happened at all. But this was a crucial moment in European history. Far off, in Sarajevo, a single shot fired at the Archduke Franz Ferdinand set in chain a sequence of events that would lead to the Great War, which would change rural East Anglia forever. It was also to have an unforeseen effect on what happened next. The Higdons set up an open air school on the village green. Magnificently, the great majority of the poorer families of the parish took their children out of the village school and sent them to learn from the Higdons. The establishment reacted. The Rector, shamefully, expelled the striking families who held allotments on his land, and he had their crops destroyed. Other families were given notice to quit from their tied cottages. However, these evictions were not carried through, because the Great War had led to a serious shortage of labour, and the tenant farmers simply could not afford to lose their workers. The principles of the farmers were not as strong as those of the farmworkers, or perhaps they were merely pragmatic. In the event, the Strike School survived and prospered, moving into a carpenter's workshop that first winter, and then into a fully equipped, brand new school funded by collections made by Trade Union and Socialist organisations around the world. The church school also continued, and by the 1920s the two schools had settled down into an uneasy but workable rivalry. The old order was falling away, the Reverend Eland retired, and his replacement, Francis Smith, supported both schools equally, giving religious instruction in both. The Strike School lasted until 1939, by which time the Higdons were both in their seventies. After Tom died, Kitty gave up the school, and it closed. The strike had lasted 25 years. Today, the Strike School is a museum, but the village green is still the focus for a national Trade Union rally on the first Saturday of each September. The village school continues to survive in the same buildings from which the Higdons walked away a century ago. For many, the main reason for visiting Burston today is the Higdons and the story of Britain's longest strike. 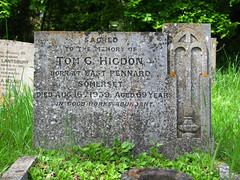 The Higdons are buried side by side in the churchyard in simple graves to the south-west of the church, by the churchyard wall and only a few yards from the Strike School that they set up.